I know that lots of people only occasionally fly. I know that airports and airport etiquette can be very foreign. I do not expect expertise from my fellow travelers, and, in fact, sometimes exhibit airport clumsiness myself. That caveat aside, seriously, what the hell is wrong with some of you? How do you normally figure things out? Another idea is to use environmental information. One really great technique is to read the signs. There are many, many signs in airports. People actually have jobs to create signage. You don’t have to let all their work go to waste. When I checked in for my flight, I was jazzed to see that the travel gods bestowed upon me a random TSA PreCheck. Jazz was induced especially because I was wearing boots–it’s the little things in travel. Also, I hate stripping down to my skivvies and filling up 4 or 5 gray bins with my laptop (must be alone in a bin) and shoes and scarves and a one-quart plastic bags full of liquids in containers all less than 3.4 ounces. You still can’t bring a bottle of water, though. At today’s airport, there are two concourses. My flight was out of Concourse B. Only one had PreCheck open. Of course it was the Concourse A. The sign said the concourses are connected, so I turned around and walked across the mall and food court to the other security line. The woman in front of me read the PreCheck notice and did the same. 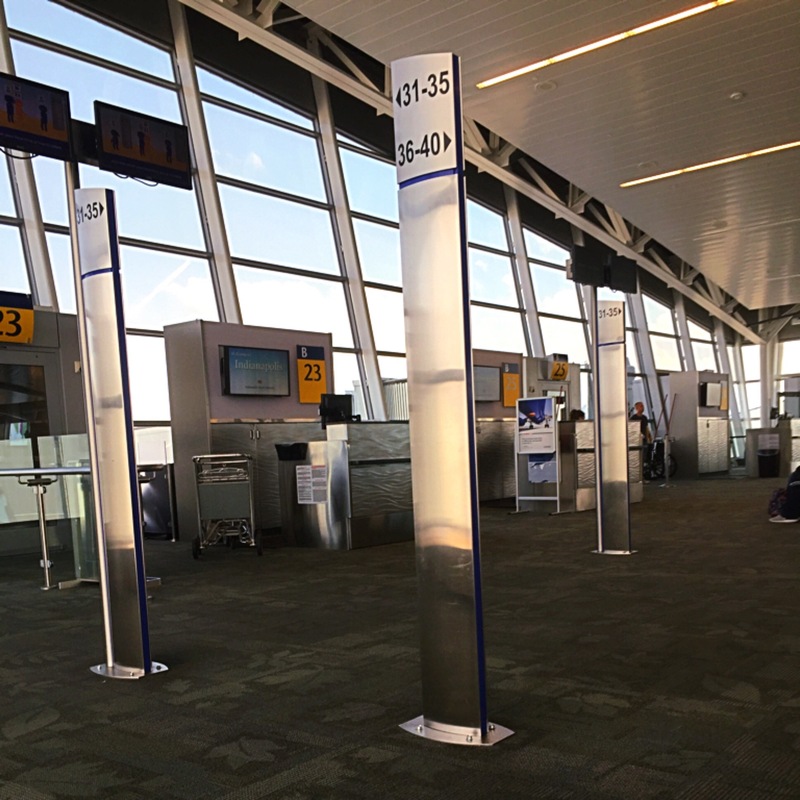 Concourse A displayed a 4×3 foot sign directing PreCheck travelers to the left and all others to the right. The sign explained the PreCheck rules which was pretty much put any bag you have on the belt and walk on through. The woman in front of me removed her shoes and placed her coat in a bin. The family of four also in front of me confusedly pulled multiple bins out. Computers and tablets, belts and sweaters, watches and quart-sized plastic bags all unnecessarily placed with much consternation. The woman behind tapped my shoulder and asked if you could get from Concourse A to Concourse B. I told her yes, at least that’s what the sign said. She said she didn’t read that part. It wasn’t crowded, so the passenger confusion was mostly self-inflicted. A TSA staffer reminded the six people in our line that they needed to have PreCheck on their boarding pass or go to the other line. A woman sheepishly ducked under the rope between the stanchions to her correct line. Another family crisscrossed to the PreCheck line from the standard line because they couldn’t read, either. I put my backpack on the conveyer belt and walked through the magnetometer. Easy peasy lemon squeezy. I’m at my gate fifty minutes before the flight. A man in black warmup gear and screaming scarlet kicks walked across the empty airport to the gate. The door to the jetway is wide open, but it’s not time to board. Will Scarlet looks around and, for some unknowable reason, decides to board himself. Seriously. He walked through the door and down the jetway a few steps and walked back out. He had his boarding pass in his hand and inspected the unattended desk and computer. He found the scanner and he SCANNED HIS BOARDING PASS. I am not making this up. Then some clueless woman saw him and followed his lead. I waited for the monster to spit them out, but nothing happened. I looked at my watch and started to worry that maybe the flight had boarded and I blew it. (I have done this once before.) Now, I’m all consternated. But, unlike my fellow passengers, I walk up to the the kiosk for my flight and check with the people who work there. No boarding yet. I walk back to my seat to see the two people who took the boarding into their own hands escorted out by an airline employee. She was explaining that boarding would be in 20 minutes. Will Scarlett looked like he didn’t understand. That was the only part that made sense, that Mr. Scarlett was confused. Still. In my head I’m wondering, did they get all the way to the door of the plane? Did they knock on it? Or was the plane door open? Did they walk on the plane? Was the pilot there? Were there people cleaning the seatbacks? Or were they just standing on the jetway until someone “found” them? And damn them for making me look. I knew better, but vagaries in the travel system, the missing of flights, the capriciousness of rules among airports and heightened or de-heightened alert status (more working dogs! ), means that you have to verify and not trust your experiences. So, you crazy mixed up travelers, my second piece of advice, in addition to reading signs, is ask the experts. The real experts. Don’t follow Will Scarlett down the jetway. At least there were peanuts on my flight.